Lowest Price Rate Plan | A Savings WOW! Looking for Ways to Cut Your Cell Phone Costs with Unlimited Plans? Disclosure: I am a member of the Collective Bias® Social Fabric® Community. This shop has been compensated as part of a social shopper insights study for Collective Bias and their client. Because it’s essential for us to stay on top of things due to the nature of our business, we are constantly tied to our cell phones. That being said, we want to be able to have as much functionality with our cell phones without having the costs bust our budget every month. On top of that, two of our children are “tweens” now, so they are starting to ask for their own cell phones. We would like to provide them with some, but still be able to know what the costs will be and to be able to control how much they use their phones. Especially with our children’s phones, we don’t want to be locked into a long-term contract. We visited Walmart to find out more information about their Walmart Family Mobile program powered by T-Mobile. The thing that attracted us most to the program is that there is one set price – $39.88 monthly for unlimited plans – unlimited talk, text, and web. It’s only $24.88 monthly for each additional line, up to 5 lines. That would definitely take care of most of our family. We decided to purchase the Standard & Micro SIM Starter Kit because we have an HTC smartphone that neither one of us is using. We will try out the service to see if it meets the needs of our family. If we didn’t have a phone already, the prices to purchase one and use it with the Walmart Family Mobile plan were very reasonable. Check back with us next month when we tell you how it’s going with the Walmart Family Mobile Unlimited Plans. Let us know how you’ve been cutting down on your cell phone bills by leaving a comment below! Be sure to check out our Google+ album for more photos of our shopping trip at Walmart. I’m interested to see how the plan works for your family. 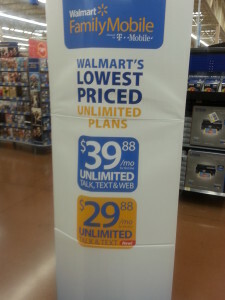 It’s great that Walmart is getting into the business of offering a family smart cell phone plan. The prices for family and individual plans are so high right now its impossible to have communication established for your whole family and your business. Good luck. I love how affordable this is! I Need to check this out for my family!